This stately Williamsburg wall sconce is a historically accurate choice to add a classic elegance to your colonial decor. The distinguished colonial lines of this sconce make it an ideal complement to wall hangings in a formal Early American room. Hammerworks Colonial Williamsburg Wall Sconce S140 is among the finest handmade lighting reproductions in the USA. Especially relevant this imposing Early American Antique Wall Sconce is also available in a mirrored version. 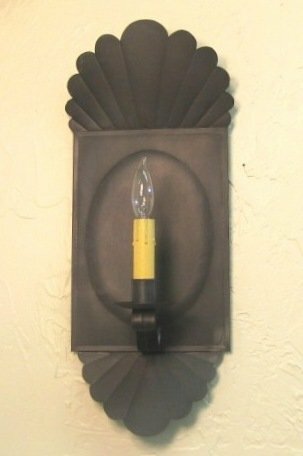 Consequently you can choose Williamsburg Primitive Wall Sconce S141 if you prefer a more dimensional look. Either way with its’ 20″ height and 7 3/4″ width this impressive Antique Reproduction Wall Sconce is a commanding presence wherever you place it. No matter which you prefer Classic Design Tin Wall Sconces combine beauty and function. 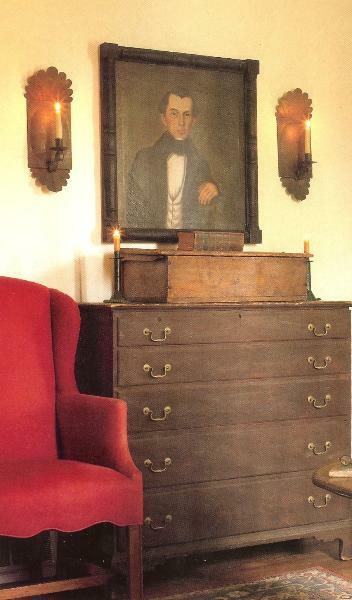 Therefore Antique Colonial Wall Sconces are a versatile decorating accessory for any room. Most importantly we handcraft each Colonial Reproduction Wall Sconce in a choice of antique tin, brass or copper. In addition we offer several Vintage Tin Wall Sconce styles with 2 or 3 candles. Thus they are ideal for any area requiring additional lighting. Furthermore each Antique Reproduction Sconce candelabra socket is UL listed to accommodate 60 watts. Most noteworthy you can choose from our superb collection of Colonial Wooden Chandeliers to combine with your Colonial Williamsburg Wall Sconce. You will love the look of Elegant Colonial Chandeliers CH322 complementing your Colonial Williamsburg Wall Sconces. Another excellent choice is Country Wooden Chandeliers CH203. In addition Colonial Home Wooden Chandelier CH121 has a look all its’ own. Furthermore this classic handcrafted Antique Wooden Chandelier is available in three sizes. This versatility provides several options for you to choose from. Most importantly we custom create each Early American Reproduction Wooden Chandelier to your exact specifications. You can choose from a variety of paint and stain finish options to match your decor. In addition we will be happy to use your own paint or stain color if you choose to provide it. Also you can opt for either antique tin or antique brass arms, chain & ceiling canopy for your Antique Reproduction Wooden Chandelier.